At Lingraphica, it's important to us that our customers have a device that meets their communication needs as well as their lifestyle. Whether you prefer a laptop for maximum screen size, a mini-tablet for the ultimate portability, or something in between, we've got three different devices to help you communicate again. All of our devices have the same icon-based language system built into them. This system includes more than 4,400 adult-appropriate graphic icons and animations that represent 9,000+ words, which empowers you to find your voice by quickly building phrases to help reconnect with family, friends, and community. Each device has a touchscreen and on-screen keyboard. Now that you know what's common to all three devices, let's take a closer look at these to see what's different about them. The TouchTalk is our most popular device. Weighing in at just under 1.5 pounds with a 10" screen, the TouchTalk is easily portable and comes with a protective carrying case, making it discreet to use in a variety of social settings. The TouchTalk is very similar in size to other popular tablets, like the iPad. The MiniTalk is the smallest of our devices at just over an 8" screen and weighing under one pound. The MiniTalk makes taking your communication device almost anywhere a true reality. It is the most portable of our devices and also comes with a protective carrying case. With three great options to choose from, you can begin communicating again with a Lingraphica device that suits YOUR life! We'll even pre-program your device with your interests—from family to activities to your favorite foods. Your device will be customized to YOU—right out of the box. If you've been hesitating to try a Lingraphica device, there's no need to wait any longer. 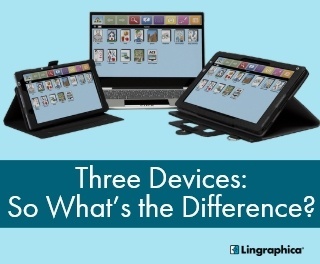 We offer a free device trial with the help of a speech-language pathologist who will help you to learn how to use the device. Ready to regain your voice? We're your partner for the journey!